It's all about Chinese New Year dining this month as we approach the celebrations in February. From 2 Feb till 5 Mar 2015, Pan Pacific Singapore will be welcoming the Year of the Wooden Goat at all its restaurants. Here's a review of the dishes available at Hai Tien Lo. 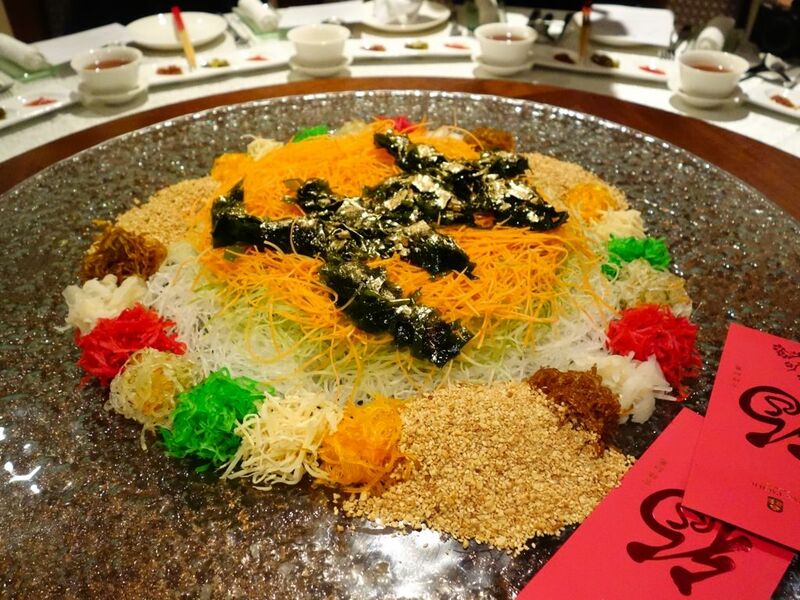 Yu Sheng is a must during CNY and i love tossing this Chinese salad. Hai Tien Lo's version has plenty of premium ingredients e.g. fresh lobster, Alaskan Crab, Hokkaido Scallop, Norwegian Salmon, Salmon Roe and Japanese Kelp. My favorites were the scallop and lobster sashimi. I thought the fried fish skin lent a nice crispy texture to the dish as well. On balance, the dish requires a bit more tang. 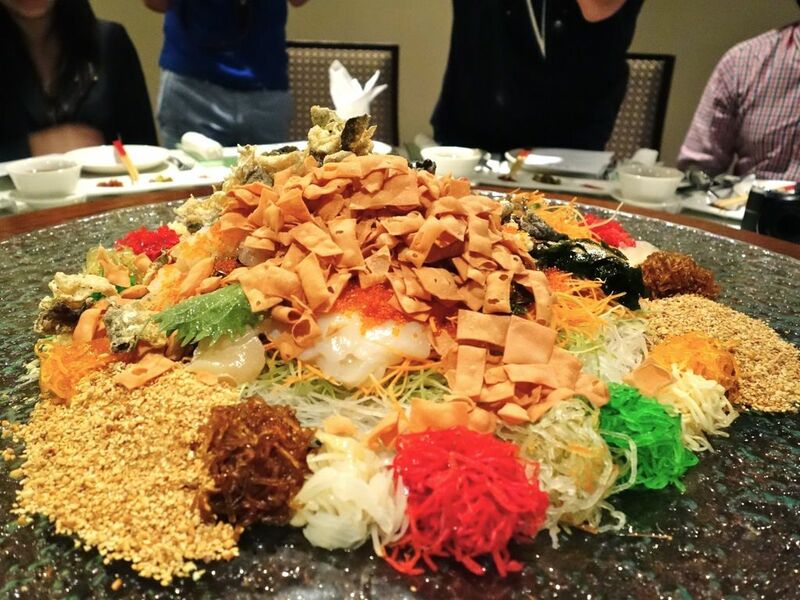 Hai Tien Lo’s Yusheng platters are priced between $38 and $228 and are available in both small and large sizes. The double-boiled soup was typically Cantonese and absolutely delicious. 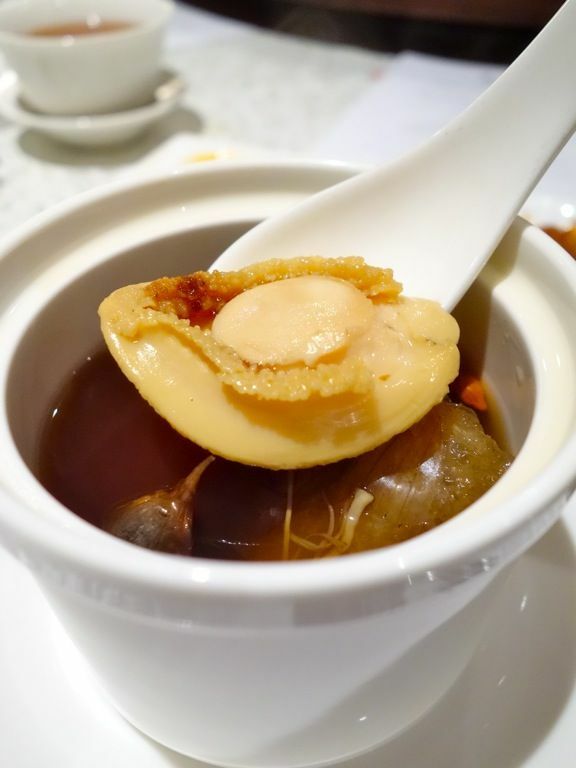 Abalone, Fish Maw, Dried Scallops, Sea Cucumber and Fermented Black Garlic were added to a rich stock and steamed in the little bowls. It also happened to be my first time tasting the widely popular fermented black garlic! I was surprised by its sweetness and it does not have the typical pungent and stingy garlic flavor. I thought the taste was reminiscent of a Chinese Rice Dumpling (Ba Zhang) and it had a strong five spices flavor. Don't worry about it affecting the taste of the soup as the flavor is rather contained in the garlic. Chef’s Signature Trio of Treasure was then presented. My faith in Hai Tien Lo's dimsum isn't misplaced as we dug in to juicy steamed prawn dumplings. That crackly suckling pig slices did not come with the typical sauce but each piece was nicely seasoned with fermented taro curd sauce already. YUMS. While the little squid paste salted egg bumblebees looked cute, i could only taste salt in this one. 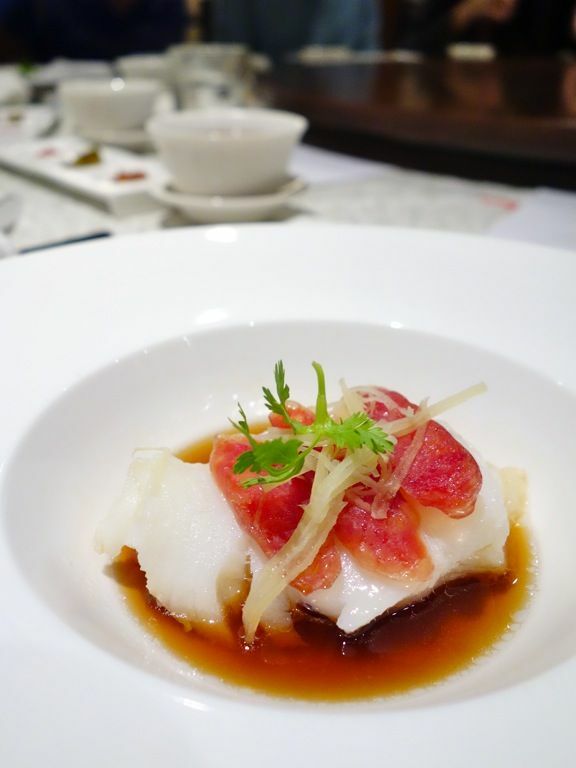 Steamed Sea Perch Fillet with Preserved Meat and Shredded Ginger. I think it's official that i'm starting to like fish more, especially if they are done this way. 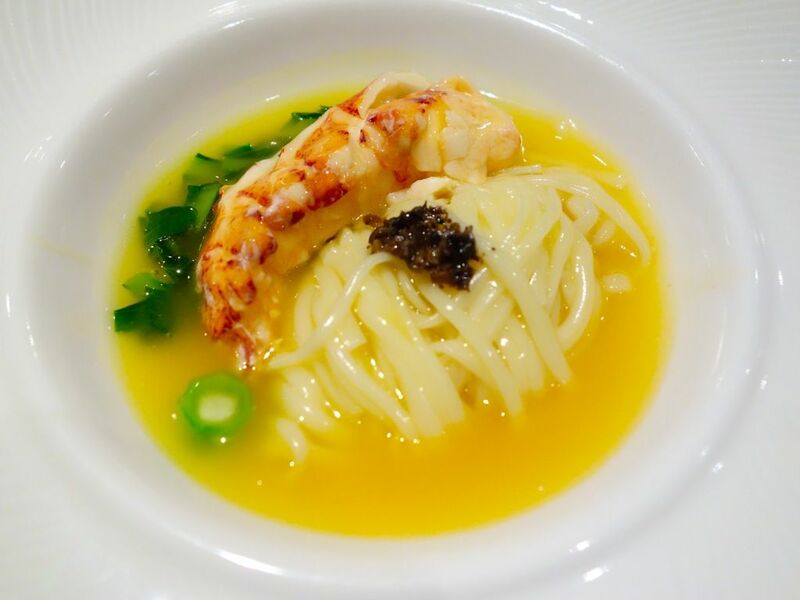 Stewed Inaniwa Udon with Lobster and Truffles Sauce in Supreme stock. Comfort and decadent food. The noodles had a light saltiness to it that tasted like mee sua. Birds nest is my weakness (what to do, mama spoiled me since young)! Double-boiled Imperial Swiftlet’s Nest with Maltose and it tasted like cheng tng! 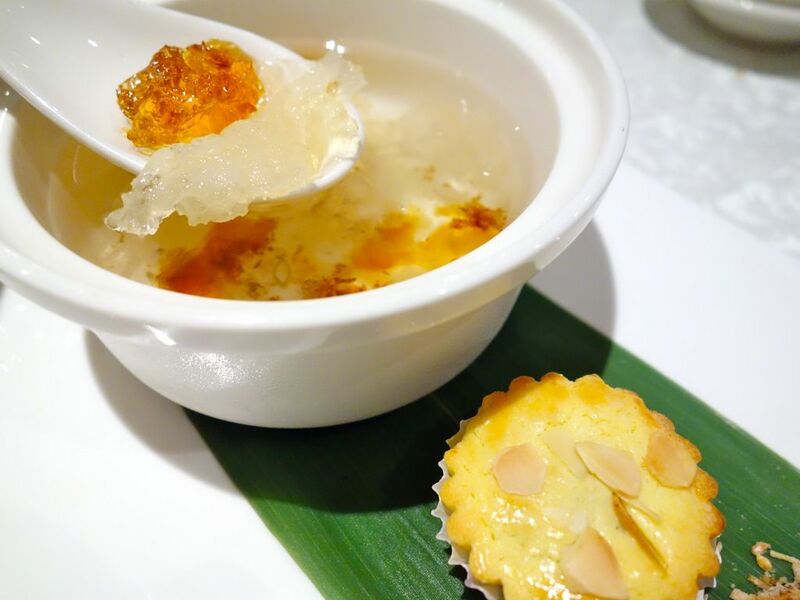 The pineapple tart was perfectly crisp with a hint of orange peel flavor in it. I was the only one who noted that and Chef commended me on my sharp tongue. Heh. Love this one! Making a mental note to get a bottle from the Pacific Marketplace. 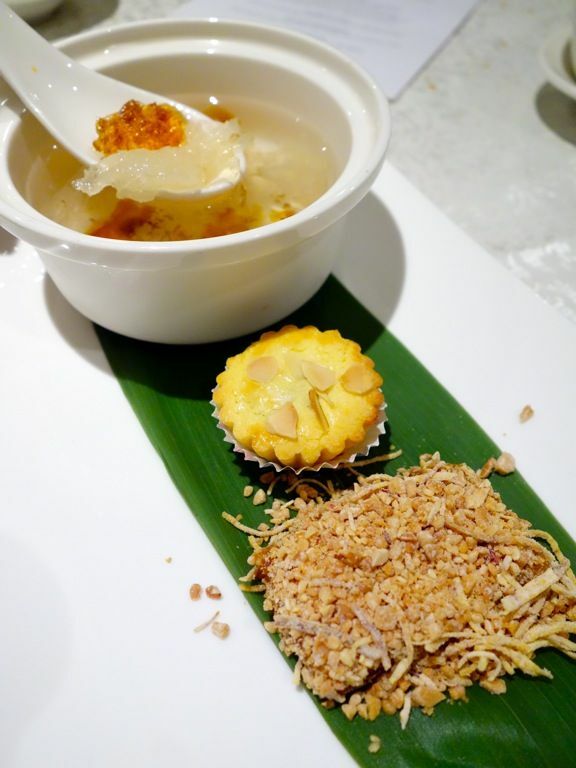 Nian gao is a must and i liked that this version has peanuts and fried taro strips for that added crunch. It kinda reminds me of mua chi or a dry tang yuan. 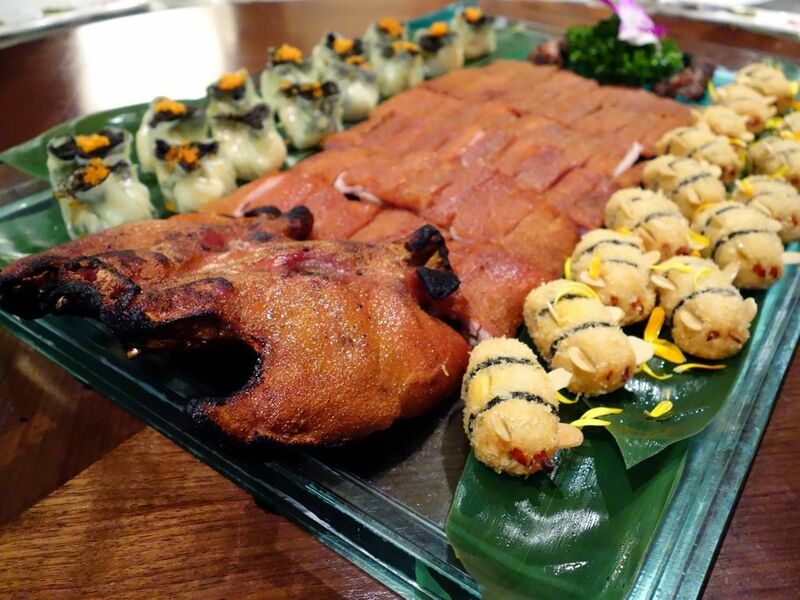 Hai Tien Lo offers Prix Fixe menus for the CNY season for dine in groups of at least 2 guests ($108 onwards/pax). Keyaki and Edge also has their own CNY specials so be sure to check them out if you want alternatives. Advance orders for all sweets from the Pacific Marketplace start from 26 Jan 2015.